I’m a day late for a post on MLK Day, but I did want to put something up. 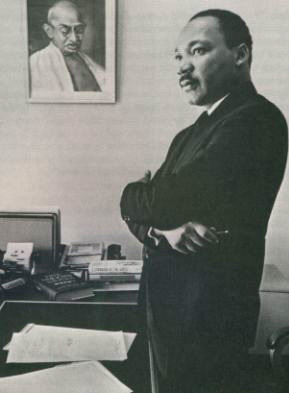 Mostly I want to offer the reflection of Charles Johnson, the brilliant novelist and philosopher, about the a potential connection between Martin Luther King, Jr. and the Mahayana Buddhist ideal of the bodhisattva — an individual intent on awakening for the benefit of all living beings. As Johnson notes, the bodhisattva is motivated by this vast aspiration to benefit all living brings (known in Sanskrit as bodhichitta). King would describe it as agape — the overflowing love of God in the hearts of women and men. We might also note that another main task of the bodhisattva is to teach the interdependent nature of reality (known in Sanskrit as shunyata or pratitya-samutpada). It’s hard to find a better expression of that sentiment than King’s two quotations above. This entry was posted in Buddhism and tagged bodhisattva, Charles Johnson, Mahayana, Martin Luther King Jr., MLK, Top Menu by teachingasianreligions. Bookmark the permalink.